Envy - Why are his nuts bigger than mine? Title got a chuckle - well framed and focused animal shot, even without being much to do with the challenge. 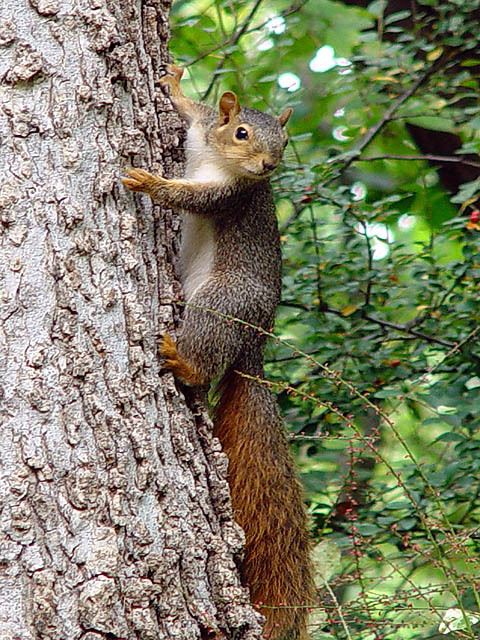 This is a good picture of a squirel, but I think your stretching it on meeting the challenge a little bit. It's tough to catch squirrels so clearly. Nice job. The title is the only thing that makes this photo work for "envy" The quality of the picture is good though. Misses the challenge without your title to explain. Nice photo though. Exceptional picture. Good quality. Good centering. Good depth. Fantastic. One of my very few 10s. watch out, my good friend amber just got bit by a squirrel, and apparently rabies shots are harder than you'd think to get. Without the title, it has nothing to do with this challenge. It is however a nice picture. hey, ther are kids surfing here!!har..har!! Great title! Great picture! Vey funny! Only the title makes it applicable though! Heheheheh! Very funny, and a great nature pic! funny title good picture. thanks for the laugh. nice squirrel but not sinful. Really funny title, but this picture hardly portrays envy. If it weren't for the title, I wouldn't have even known. Great squirrel shot! There is nothing more difficult than photographing squirrels. I have tried for years and only end of with the tip of a tail. I take my hat off to you. Nice image, but youve chopped the tail. Also, try using the rule of thirds to eliminate the cluttered background and show the bark texture. If the squrrels often use this route up the tree, and its in your back garden, try clipping some of the hedge back to make for a cleaner shot next time. Proudly hosted by Sargasso Networks. Current Server Time: 04/21/2019 02:07:10 AM EDT.